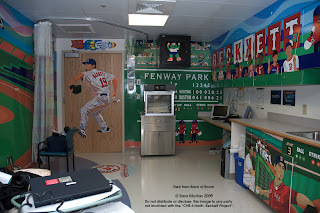 L'Attitude Gallery Art Consultant, Betty Bothereau, recently installed exciting new artwork in the Josh Beckett Oncology Treatment Room at Children's Hospital in Boston. Interested in Corporate Art Rentals or Art Leasing in Boston? Contact L'Attitude Gallery. L'Attitude Gallery will rent or lease artwork to corporate offices, restaurants, private clients and others interested in the benefits of an artwork leasing program. We have a large artwork collection to select from - in a variety of media. We welcome inquiries. Rent or lease payments for artwork are tax-deductible because they are considered a business expense. Companies relying on venture capital can avoid carrying artwork assets on their books. Artwork can give the workspace sophistication and style. Pleasing visual surroundings benefits worker morale. 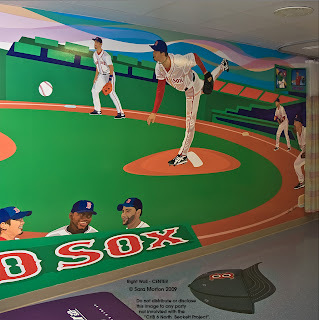 Leasing artwork offers complete flexibility.